I finally made my way to the Kaminski House and met with Robin Gabriel and Kim Leatherwood who are currently the director and the assistant director of the Kaminski House Museum. Graciously, Kim sat down with me to talk about the history of this magnificently beautiful home and establishment. There are only a handful of places in Georgetown that are absolutely lost in time. It’s as if you walk in and are whisk away into another era. The Kaminski House is one of those places. The Kaminski House, which overlooks the Sampit River, is a very historical dwelling in Georgetown, South Carolina. 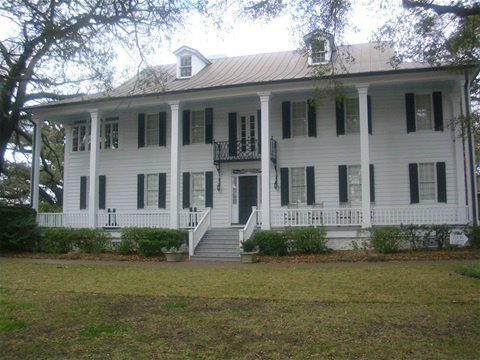 It’s one of the oldest structures, being an original plantation house. It was built by Paul Trapier, a wealthy businessman, who reportedly had given the house to his daughter the night before the onset of the Revolutionary War in 1769. Originally, it was a single house with a stairwell in the middle, separating the two upstairs and downstairs rooms. The original kitchen was located outside (it has since burned down), where the servants would make the food and then bring in the meals to the dining hall. Now, the kitchen is off the dining room on the first floor. The slave quarters, and later, the servant’s quarters are now the gift shop for the museum. A lot of remodeling has been done to the Kaminski House, started by Mayor George Congdon in 1840. He was the first to enlarge the house. Later around the 1940’s, it was remodeled and enlarged again by Harold and Julia Kaminski. “Julia Kaminski, the last Kaminski, passed away in 1972,” Kim explained. “She left the house to the city and it is run by the Friends of the Kaminski House which is a non-profit organization. I know some of stories from taking a couple some tours in the Kaminski House. One of those stories is about Julia and Harold’s dog, Frank. Since they were not able to have children, Frank was their child. I’d heard stories that Julia would sometimes dress him in doggy clothes and when he died, they had a full dress funeral. Although Kim did confirm the dog’s name was Frank, I forgot to ask her more about him and where exactly his gravesite is as he’s buried on the property. I’ll have to take the tour again to find out. There was no man there for the guided tour. There was only the volunteer and the class. Many have guessed it was the ghost of Harold Kaminski enjoying the stories of lore about his lovely home. I’ve noticed there are a lot of events that take place with the Kaminski House and I asked Kim about the different things. “My daughter was married here,” I offered. “You decorate the house for Christmas?” I asked. Kim and I sat and talked about many things, including the Stewart-Parker House which is next door, and also a part of the Kaminski House Museum tour. Although, I did know about the tours, the weddings and the Stewart-Parker House, I never knew about the other social events of the museum and I have to say, I was very pleasantly surprised. The children’s events give our local children a chance to learn about their heritage, their town and the history thereof. The projects encouragingly stimulate and educate the children of their town’s history. These occasions are not just limited to Georgetonians; children and adults from anywhere can join and be included. Friends of the Kaminski House and Anderson Brothers Bank bring some of the other events that take place around the house. They sponsor the Indigo Choral Society, which performs on the front lawn of the Kaminski House on the Fourth of July. This event includes songs from the American and Carolina genre, as well, as a salute to our Armed Forces. Don’t forget the snacks and beverages, either. Kim tells me that Jazz Under the Oaks is a big hit amongst the crowd. It has music from Denny Hess Trio, a Sweets Tent and even a wine tasting event. “I don’t know if you know Kevin Jayroe, but he often makes a special appearance with Denny Hess Trio,” Kim added. The Long Bay Symphony Youth Orchestra also performs on the lawn of the Kaminski House with “some of the area’s most talented young musicians.” The days and dates vary, but I will be sure to call the Kaminski House in the future to find out the current times. I cannot wait for the Jazz Under the Oaks to come around again! Thank you Kim Leatherwood for your time and thank you Julia Kaminski: Without you, we would have a blank page in our town’s beautiful and nostalgic history.